As destination weddings go, the Maldives continuously sit pretty at the top spot – and it’s not hard to see why. Imagine saying ‘I do’ on a sugary sand beach framed by towering palm trees, fresh orchids and the beautiful backdrop of the glittering Indian Ocean. You really couldn’t get more idyllic if you tried. Nature and location aside, the Maldives actually come with a whole host of other benefits that make it the perfect spot for you big day. In fact, organizing your big day in the Maldives can actually be a lot smoother and easier than planning a wedding back in your home country. Are you thinking of tying the knot in the tropical paradise that is the Maldives? If so, read on for everything you need to know to plan your dream day. Unlike booking a wedding back home, when you choose to get married at a Maldives resort you will be assigned your own wedding planner to assist you with planning everything from the invites to the flowers and the photographer. If it’s a large wedding, you may even be given access to a whole team who are there to support you and make your dream Maldives wedding come true. Top Maldives resorts have professional wedding planners who have had many years experience putting together dreamy destination weddings, so you can rest assured that you will be in good hands. These wedding planners can be contacted through email, phone calls, messaging and even face to face Skype calls, where you can discuss your vision for your Maldives wedding. The icing on the wedding cake is that access to these planners is included in your Maldives wedding package cost. It may come as a surprise to many to know that for non-residents, a wedding in the Maldives is not legally binding. For this reason, many couples choose to either get married prior to the wedding in their home country and then treat the Maldives wedding as a ceremonial wedding. Or, you can choose to do it the other way around by having the ceremony in the Maldives, and then getting legally getting married back in your home country. This is actually a nice option, as the allows you to invite guests that may not be able to travel to the Maldives to be at your wedding day. It’s also an excuse to have two celebrations for your big day! No legal documentation is required to have a blessing ceremony in the Maldives. The number one spot to actually get married on any Maldives resort is on the beach. The wedding planners can set up a gorgeous gazebo entwined with tropical flowers and palm leaves. If you are thinking about getting married on the beach then you need to consider the time of year that you choose to have the ceremony. The Maldives has two seasons: High and low. During the low season, rainfall is much more common, so if you really want a sunny Maldives beach wedding, then it’s a good idea to go for a high-season wedding. Check out the Maldives weather guide below for more details on average monthly temperatures, rainfall and sunshine. Another thing to think about is the time of day that you get married, as during midday the sun’s rays are strong and it may be uncomfortable for some guests to sit outside during this time because of heat. Many people choose to get married just before sunset, as not only is it cooler but you also get those gorgeous peachy skies as a backdrop. 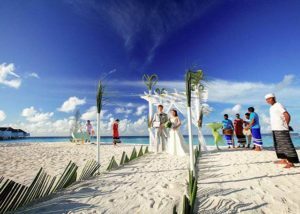 If you don’t want a Maldives beach wedding, then you can also choose to have the ceremony in the Maldives resort. Most of the Maldives resorts will actually have a dedicated wedding area where the ceremony can take place. They are usually grassy areas complete with gazebo and space for seating, as well as stunning ocean views. The benefits of having a resort wedding is that you won’t get sandy, and there may even be sheltered and shady areas for guess who want to stay out of the sun. When it comes to the actual ceremony, you can choose to be as creative or as traditional as you choose. If you want a traditional style wedding, then you can have someone bless you both and go through the vows as would back home. Because of the destination, some couples like to incorporate some of the Maldivian culture in their wedding ceremony. Traditional Maldives weddings are quite a vibrant affair, and include a large procession of locals playing drums called bodu beru. The drummers are dressed in traditional Maldivian clothing, and will play the drums as you walk down the aisle. This is a lovely addition to any wedding and it adds a nice lovely atmosphere and brings in some Maldivian culture to your big day. Many of the big resorts also offer packages that include bodu beru drums within the ceremony. The Maldives enjoy a warm and tropical climate all year round, however, there are two main seasons: high season which runs from between December and March, and low season which runs from April to November. During the high season, also known as the dry season, you can expect the largest amount of sunshine per day. If you want to give yourself the best chances of maximum hours of sunshine, then book your wedding in February. If you do choose to go in the high season then be prepared to pay much higher rates for your wedding package in the Maldives. During the low season you can expect rain showers, sometimes on a daily basis. However, these are typically the light and often pass quickly. The benefits of choosing a wedding in the Maldives in the low season is that you can save a large amount off the cost of it, sometimes even up to as much as 50%! If you want more information on the month by month weather in the Maldives, including monthly temperatures, average hours of sunshine and rainfall, then check out this guide to Maldives weather. Getting to the Maldives has become increasingly easier as well as more affordable in recent years. 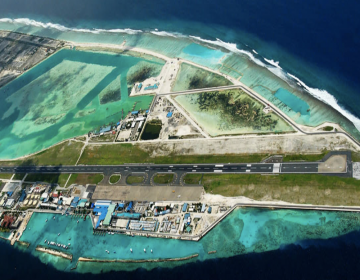 In order to get there, you will need to fly to the main International Airport on the island of Huhule. Many airlines now offer direct flights to this Airport. You may also want to think about having a stopover on your way back to split up your honeymoon. For example, Dubai is a particular popular destination stop off on the way home, and allows you to split up your beachy honeymoon with a city break too. 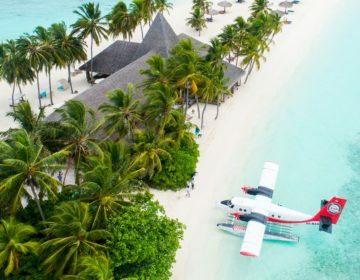 Once you arrive at the international airport, you will need to either get a seaplane or a speedboat to your chosen Maldives Resort. Again, your resort’s concierge will be able to do all the planning and organizing for you – all you need to do is provide them with your flight details. It is worth noting that the cost of a seaplane Journey can sometimes be the same price as an international flight. So remember to add this into your budget and make your guests aware of that fact. 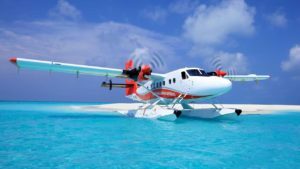 If you have a big group of people traveling to the Maldives to be at your wedding, then you can hire out private seaplane flights just for your group. Seaplane flights can only depart daylight hours, so if any guests arrive after dark, they will be required to stay for a night on the main island before getting a seaplane flight in the morning. How Much Does a Maldives Wedding Cost? Did you know that the average cost of a wedding in the US is a whooping $33,000? And if you choose to get married in Manhattan, then you can expect to pay double that price. Well the Maldives isn’t known as a low-cost cost destination, you will be surprised at the great value wedding packages on offer. Wedding packages in start from around just $500 and can run up into the tens of thousands of dollars. A bonus of booking a wedding in the Maldives is that you’re already at your honeymoon spot, so you won’t have to shell out for extra flights to get to your destination. For many, a wedding and honeymoon in the Maldives is actually more of a an affordable dream than once thought. The Maldives resort wedding packages will often include everything you need including the flowers, a makeup artist, a photographer, drinks, music and so on. You may want to think about adding in some optional extras for your wedding such as sunset cruises, couple massages, the drummers, canapes, and a romantic beach candle lit dinner. If your budget is quite deep, and you want a luxurious wedding with all the trimmings, then we suggest you take a look at the wedding package on off at the Conrad Maldives. 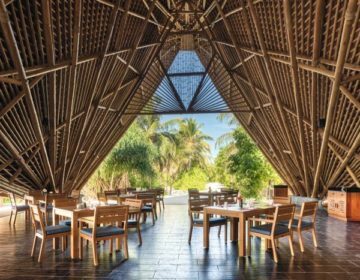 This picture perfect five-star resort is located on Rangali Island, in an area that is famous for having some of the best marine life in the Maldives. The generous wedding package includes everything you need for a magical, fairytale wedding with a tropical twist. Book your wedding package here and you will receive flower decorations, a flower arch or gazebo, welcome drinks, bouquet, groom corsage, hair stylist and make up artist, photographer, music, and a couple spa treatment for two. What really makes a wedding here different is that you can choose to go for the romantic beach setting, or you can get married underwater in the world’s only undersea chapel! It’s positioned five meters underwater, and allows you to say ‘I do’ as sharks, turtles and a whole array of tropical fish swim by. The Conrad Maldives have three different wedding packages, and all come with access to an on-site wedding coordinator. Click here to see more photos of the Conrad Maldives, and check out the latest rates on a stay. “Grand yet intimate. Lavish yet understated. From beachside soirees to moonlit celebrations, celebrations of dazzling perfection”. One and Only Reethi Rah offers a ‘Legendary Sunset Package’ where you receive access to a dedicated celebration specialist and they can arrange a beautiful ceremony decorated with fresh orchids. The package comes with a bridal bouquet, a flower buttonhole for the groom, floral head face piece, floral confetti, a wedding cake, a newlywed golf buggy complete with flower decorations, as well as a candlelit dinner in the main Reethi Restaurant. They will be also be able to help to create personalized wedding stationery including beautiful menus and name places, an organize a photographer, videographer and even bodu bera drummers and dancers. Click here to see more images of stunning One and Only Reethi Rah, as well as the latest room rates on a stay. So a Maldives destination wedding may actually be more affordable than first imagined. With the addition of access to a professional wedding planner, you will find planning a Maldives wedding to be very hassle-free. 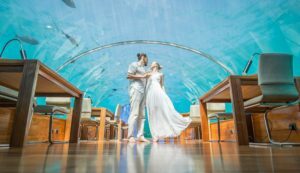 We have more information the help you with planning your Maldives wedding, check out this article for more details on what you need to know before you go. Have you had a wedding in the Maldives? Feel free to share your tips and thoughts in the comment section below, and help brides-to-be plan their dream wedding in the Maldives.